Toyota Selects Steve Collins's idea as a Finalist in its "Ideas for Good Challenge." Webb's Co-founder Steve Collins recently submitted an idea to Toyota's Ideas For Good Challenge. Steve's idea has been shortlisted as one of 5 finalists (for the Solar Ventilation category). Toyota challenged entrants to develop ideas to "repurpose" Toyota's advanced technologies for use in non-automotive applications that would help make the world a better place. Everyone at Webb would be very excited if Steve wins: The winners in each category will meet with a team of Engineers from Carnegie Mellon University, who will focus on creating a prototype of the concepts. 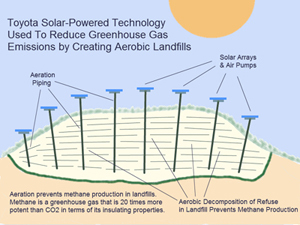 (Solar Aeration at Landfills – Steve C.) - Tell your friends! More About Steve's Idea. Steve's idea relates to applying Toyota's Solar-Powered Ventilation Technology in an application that would help reduce the environmental impact of landfills, while making them safer and more sustainable. Steve's idea is to apply solar-powered air pumps to help make "Aerobic Landfills" a more cost-effective alternative to conventional landfills. His inspiration came from his time managing an alternative energy power plant that was fueled by landfill gas. Based on this experience, Steve believes that while burning landfill gas is preferable to letting it escape into the atmosphere, it is a problematic fuel source and one that is not truly cost-competitive (when compared with other power generation alternatives). To date, landfill gas powerplants are typically cost effective when alternative fuel tax incentives are available or because of the value of getting rid of problematic landfill gas that can be avoided in the first place. Steve believes a better approach to flaring or burning landfill gas, is to limit the production of "conventional" (methane-based) landfill gas in the first place. "Aerobic" or "Semi-Aerobic" Landfills are popular in other parts of the world, such as Japan. Aerobic landfills greatly reduce the amount of Methane gas that is released into the atmosphere by landfills. While Methane is a great, clean-burning fuel source, it is also a potent greenhouse gas when it is released directly into the atmosphere. In the U.S., landfills generate many millions of tons of Methane every year (much of which is released into the atmosphere). The US EPA estimates this release is equivalent to more than 115 Metric tons of CO2 per year (Tg Co2 Equiv.) - in terms of its greenhouse gas impact. (Tg CO2 Equivalents= "teragrams" of CO2; 1 Teragram=1 million metric tons). Another benefit of aerobic landfills is that refuse breaks down much more quickly when compared to conventional landfills. This can help reduce space requirements for landfills and/or increase their useful service life significantly. Finally, aerobic landfills eliminate the problem of methane gas "migration" to nearby communities, a problem that is still prevalent in areas of the world where landfills do not have liners, venting or flaring systems. Such migration can cause fires, explosions and health hazards from inhalation. Please vote for Steve's idea (or your favorite idea)! People can vote once per day for the rest of this month Public voting will be one factor the judges will consider when choosing a winner.